I've been a bit quiet, I know. I need to post updates on Audrey. It has been a *very* long two months, with another couple of months go, getting her through this knee reconstruction. I don't think we were at all prepared for how physically demanding this process was going to be. It was not explained well to us at all. Getting Audrey in and out of the big van isn't easy, and that combined with Angela's liver related hygiene issues have left us largely home-bound. Like I said, its been a long two months. One week from today, on Friday April 8th, Angela is scheduled for the first of 3-4 surgeries. This will be an attempt to gradually close the vascular malformation in her liver. This procedure has never been attempted before for this type of malformation. The only thing that scared me this much was being told I have cancer. Actually, I think this scares me more. I cannot convey to you the seriousness of this surgery. I cannot convey to you how high risk it is. But I can show you some more images. Do you see the large blue vein that runs behind the organs? That is the Inferior Vena Cava, or IVC. It brings the blood from the body back to the heart to be re-oxygenated. It is huge, to handle the high volume of blood. 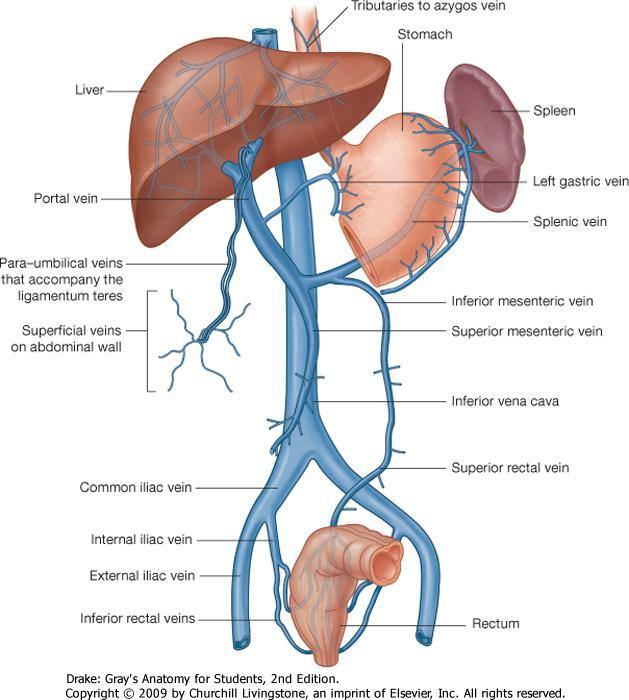 In front of it lies the Portal Vein, which brings blood into the liver to be cleansed of impurities, like ammonia. 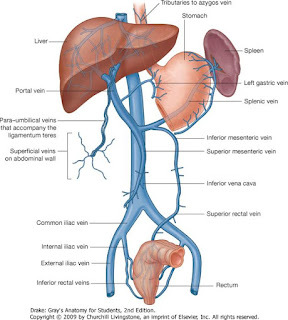 Do you see, right at the base of the liver where the portal vein starts to branch out into the liver? In Angela that first branch is inside her liver. However, instead of just moving into the liver, it re-connects to the IVC right there. It is a very large connection, which causes the majority of Angela's blood to go straight back to her heart without being cleansed of ammonia and other toxic blood waste. 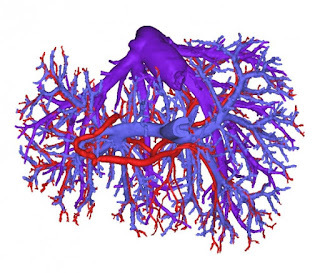 Once inside the liver, the portal vein branches out into hundreds of tiny little vessels, which bring the blood further into the liver so the liver cells can do the scrubbing. Remember the car wash? These are all the little stalls in the car wash where the individual cars get washed. Its a crazy mess of vessels. Unfortunately in Angela's case, because the blood flow through her liver is not adequate, those collateral vessels are not fully formed. Some are there, just smaller than they should be (similar to a balloon that has never before been inflated), and some are completely missing. When God created the liver, he created a miracle right there. And then God created doctors, giving them the smarts to understand all this stuff and taught them how to fix it when it doesn't work just right. Next week three smart doctors will take a small section of veinous material from Angela's leg to use as a patch. In this first surgery they will only close a small section, attempting to reduce the junction by about 1/4. As the doctors slowly close off the huge opening, blood is going to suddenly fill those little vessels. Angela's hepatic pressure (blood pressure within the liver) is already very high at 14+. When the blood flow inside the liver is changed, the hepatic pressure will either increase or decrease, depending upon how the vessels react. If the pressure increases those vessels can begin to rupture. This would cause massive hemorrhaging. If the pressure decreases, the vessels can slowly adjust to the new blood flow. So the doctors will place the patch, then sit back and wait for a bit, constantly measuring the hepatic pressure, with a goal pressure between 10-12 right now. Once they feels she is past the most dangerous time they will finish up the surgery. Angela will have this surgery repeated 3-4 time over the course of several months, in the hopes the junction can be fully closed and the blood vessels start to function as they should. If successful, it will change her life. It will save her life. After each surgery the biggest risk will be massive blood clots. There is already an old, calcified clot sitting in Angela's portal vein. (The doctors think its possible it was a small piece of this clot that caused Angela's original stroke as an infant.) Angela will be on daily injections of blood thinners for the next several months. As long as it takes to through this process. If this process does not work, the only option left for Angela is a liver transplant. We really don't want to go there. That God comfort Angela as this surgery date approaches. She is so anxious right now. She is starting to pick at her skin and hair, which is how she shows anxiety. I pray for her peace. A calm and quiet body. We also suspect her ammonia levels are climbing. She hasn't been herself. ...for Angela's health, between now and surgery day. She's currently fighting yet another sinus infection and started on antibiotics tonight. Angela is going to have a huge incision. They told me the same or similar to the incision if she was having a liver transplant. (whatever you do, DO NOT google "liver transplant scar"!!) I pray that God guides the nurses, doctors and myself to keep Angela's pain to a minimum, and what pain she does have is well managed. ...for wound healing. Some of you have known Angela long enough to remember the horrible problems she has with wound healing. When she was seven she was in the hospital from November to March with a huge open surgical wound that would not close! The doctors think its possible the high ammonia levels were responsible for the poor healing. Each of the surgeries she has for her liver will go through the same incision...again...and again...and again. I pray that God knits these incisions closed with a breath of healing. ...for the nursing staff. We had grown attached to the staff at St. Paul Children's Hospital. When we moved over to the University of Minnesota I didn't feel as comfortable with the care Angela was getting. I don't know if it was just a lack of familiarity with the staff and routine, or if there was truly a difference. Whatever it was, I was not comfortable leaving Angela alone. My prayer is for Angela to be assigned caring, attentive nurses. ...for the schedule. This is going to be a long hospital stay. We were told anywhere from 3 days to 2 weeks in intensive care, followed by the very slow process of re-introducing food so her liver can slowly adjust to its new workload. This is going to be hard on our family and our finances. ...for Dean. He will be alone with the other kids a lot. We need to get PCA's set up who can help him a couple days per week. I pray for his stamina and patience. I pray for his health that can be affected by the increased stress level. ...for the other kids. Again, this is going to be very hard on our family. When mom is gone a lot it throws off the routine, and at least one of our kids does NOT do well with changes to the routine. And lastly, for myself. I need to stay physically healthy to keep up with the insane schedule looming before us. The emotional and physical stress really took a toll on me a couple months ago, and I don't want that to happen again. My emotions are already a bit frazzled as I deal with my own anxiety about this surgery. ..for Dean and I as a couple. We have very good communication between us, and it needs to stay that way. My blog is set up to post to twitter. If you don't already follow us there, you can find us under @GardenofEagan I'll be posting updates throughout this week, and during Angela's surgery day to keep everyone informed. We are praying. (((HUGS))) We are praying, praying, praying. Unending prayers for your entire family. Hugs. I will pray for all of you. Another teenager in the house!